Here's a peaceful postcard to bring the holiday blogathon to a close. And we could use some more peace, right? 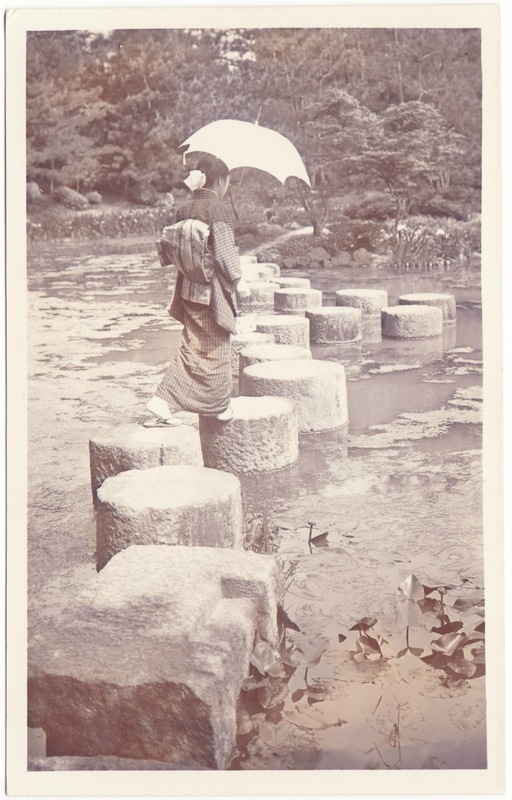 This never-used, black-and-white card from Japan features a woman crossing a pond via a set of pillar-like stepping-stones. Ogawa Jihei, a landscape gardener of the modern era also known as Ueji, made these three gardens. He designed his plans with the intention that, all over this lush garden, people would be made to feel calm. He spent about 20 years making these three gardens. ... The main attraction of the middle garden is Garyukyo and irises. Garyukyo is a series of stepping-stones in the pond called Soryu-ike. These stones were formerly piers of two great bridges over the Kamo River — Sanjo Ohashi and Gojo Ohashi — which were made by the great conqueror Toyotomi Hideyoshi (1536-1598). Ogawa Jihei arranged these stones so that people stepping from one to the next can feel as if they might be riding on a dragon flying in the sky that is reflected on the surface of the pond. About 100 purple irises found here are at their best in May. Here's another view of this garden from Wikimedia Commons. OK, I'm sold. Who's ready for a calm and relaxing road trip to Kyoto?